In its reductive exploration of misogyny in Afghanistan, The Breadwinner is reflective of how a children’s film, with its simplified, toned-down, and easily conveyed ideas, is not conducive to discussions of serious political problems. But equally faulty is the very obvious issue of who is discussing what, and for whom. A film helmed by white women—namely director Nora Twomey, writer Deborah Ellis (who also provides the source novel), and executive producer Angelina Jolie—The Breadwinner is unfortunately predictable in the clueless position it ends up adopting. 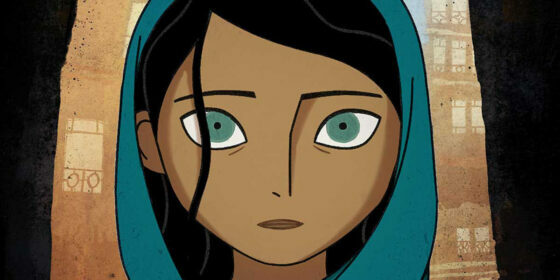 The film follows Parvana, a young girl whose father is imprisoned for having taken her outside of the home and educating her. Without a man to care for her now all-female family, Parvana cuts off her hair and presents herself at the market as a boy in order to find work. Naturally, it is Parvana alone who fights back against the host of male cruelties that inevitably come, while the other women in the film (and, it is implied, Afghan society as a whole) meekly accept their subordinate positions and inability to effect change. Director Twomey relies on conventional directorial shorthand to signify oppression: cowering women are shrieked at and brutally beaten by aggressive, power-tripping men, who loudly proclaim feminine worthlessness and desire to marry illiterate child brides. It is not that misogyny does not exist in Afghanistan, but that this culturally specific sexism is presented as a single, easy-to-understand problem, based on Western presumptions about the Middle East. Without diving into the complex socio-historical context of women’s rights, the real world is made flat, with simplistic depictions of bad men and weak women whose respective evilness and frailty are never given any concerted thought beyond a simple acknowledgment of the fact that they exist. This bleakness is its own brand of racism, wherein filmmakers (and viewers) of white Western nations can feel superior to Otherized locales without exploring oppression or resistance in any kind of depth. The Breadwinner offers no respect or agency to real women; it’s almost as if Twomey et al were consciously trying to set feminist postcolonial theory back by 20 years.